He may have arrived a bit more bloodied and muddied this time, but he once again arrived first. 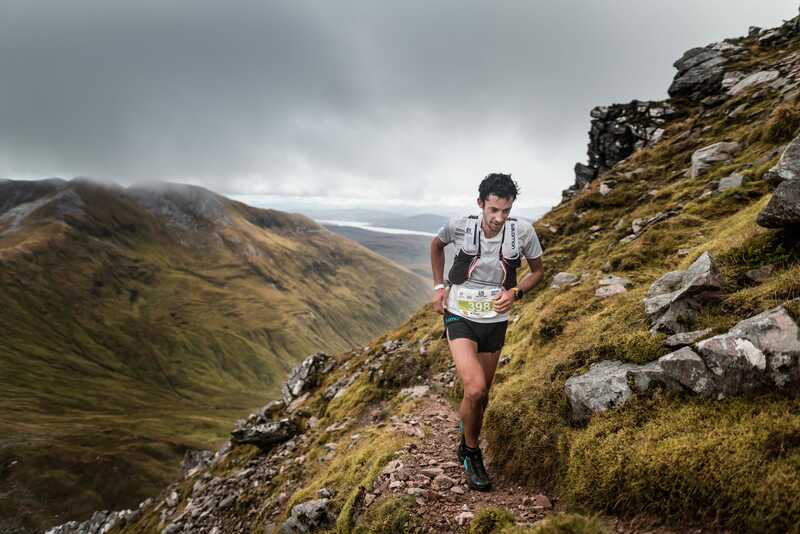 Salomon mountain athlete Kilian Jornet held off another formidable field of challengers to win the Ring of Steall Skyrace in the Scottish Highlands in course record time on Saturday to cap a perfect Golden Trail Series in which he won all three races he entered. Up and down the soggy, slippery green landscape of the glens, the Catalan led from the front this time, holding off a persistent Nadir Maguet of Italy to win by one minute and 31 seconds, in 3:04:34. Defending champion Stian Angermund-Vik (Team Salomon) of Norway cartwheeled across the line (purposely) in 3rd in a time of 3:09:05. Alexis Sevennec of France was 4th and Switzerland’s Pascal Egli was 5th. Bartlomiej Przedwojweski, Remi Bonnet, Marc Lauenstein, Sebastian Batchelor and Jan Margarit rounded out the top-10. After winning at both the Marathon du Mont Blanc and Sierre-Zinal, Jornet needed only to start the Ring of Steall in order to qualify for the Golden Trail Series Grand Finale at the Otter Trail in South Africa next month. As if often the case, however, Jornet finished what he started, though it wasn’t easy.. In the women’s race, Sweden’s Tove Alexandersson broke the course record by winning in 3:46:28, besting a pair of Brits—Victoria Wilkinson and Holly Page—who ran well to finish 2nd and 3rd, respectively. Sheila Aviles Castano and Laure Orgue were 4th and 5th. For the 26-year-old Alexandersson it was just her second ever skyrace, and she has now won both of them. 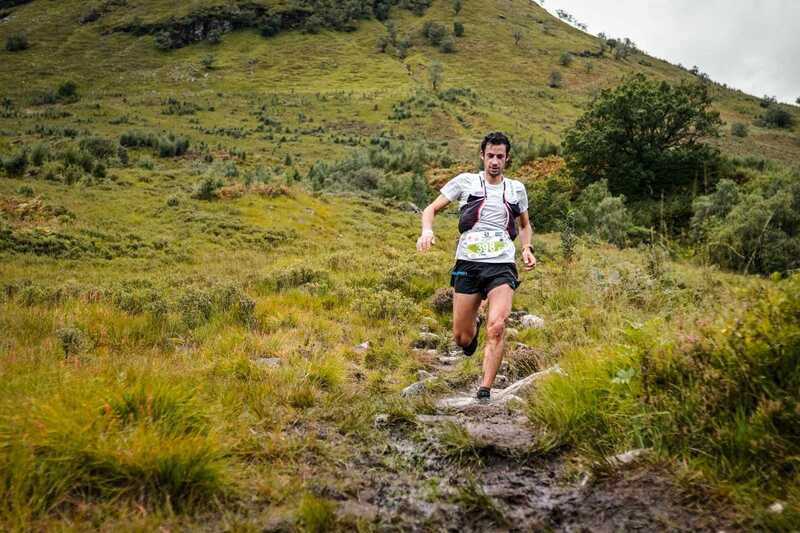 The Ring of Steall was the fifth and final race of the season-long Golden Trail Series and represented the last chance for many to grab a spot inside the top-10 and qualify for all-expense paid trip to the Grand Finale in South Africa. That left plenty of drama to unfold in Scotland, especially on the women’s side, where the final few spots were up for grabs. In the end, the top-10 women heading to the Otter Trail will be New Zealand’s Ruth Croft (Team Scott), Sweden’s Ida Nilsson (Team Salomon), Spain’s Laura Orgue (Team Salomon), USA’s Megan Kimmel (Team Salomon), Spain’s Eli Gordon (Team Salomon), Great Britain’s Holly Page (Team Salomon), Spain’s Sheila Aviles Castano (Team Buff), Italy’s Silvia Rampazzo (Team Tornado), Sweden’s Fanny Borgstrom (Team Salomon) and South Africa’s Meg Mackenzie (Team Salomon). On the men’s side, it will be Spain’s Kilian Jornet (Team Salomon), Norway’s Stian Angermund-Vik (Team Salomon), Switzerland’s Marc Lauenstein (Team Salomon), Spain’s Aritz Egea (Team Salomon), Spain’s Oriol Cardona (Team Dynafit), Switzerland’s Stephan Wenk (Team Scott), France’s Alexis Sevennec (Team Scott), USA’s Sage Canaday (Team Hoka), France’s Thibaut Baronian (Team Salomon) and Poland’s Bartlomiej Przedwojewski (Team Salomon). After missing his beloved Zegama Mountain Marathon in May due to a broken leg he suffered in a ski-mo race last winter, Jornet returned at Chamonix with onlookers wondering about his form. He won there going away and, aside from a DNF after suffering an allergic reaction to a bee sting at the Ultra-Trail du Mont Blanc (UTMB), he has remained untouchable ever since. To excel in the wet conditions on Saturday, Jornet wore the Salomon S/LAB XA Amphibian Shoes and a full Salomon race kit of S/LAB Modular apparel. On Sunday, completed his winning weekend by taking the top spot in the final race of the weekend, the 32km Glen Coe Skyline, which fuses mountain running and alpinism. He won in 3:37;13 to win by more than three minutes. In rain and strong winds, 200 athletes from across the world took on the alternative “bad weather” course through challenging mountainous terrain. The route, amounting to a total ascent of 2700m, still included the exposed Grade 3 scramble of Curved Ridge on Buachaille Etive Mor.